Javier Sanso gybed his Owen Clarke/Clay Oliver designed Open 60 onto port today for the first time since reporting an impact and running over something three days ago. As a result he was able to observe that the lower portion of his port rudder had taken an impact and broken off. This is the third occasion in twelve years that an OCD rudder has been damaged in this way. In 2001 while exiting the Doldrums in second place Ellen MacArthur crashed into a whale shearing Kingfisher’s daggerboard completely off and loosing the sacrificial tip of her port rudder. Despite having a cassette system and carrying a spare she didn’t use it. MacArthur elected to save time and after replacing the remains of her port board with the inverted starboard foil, continued chasing down the eventual race winner Michel Desjoyeaux who eventually beat her in by 24h30m. Mike Golding’s Ecover 2 lost her sacrificial tip to another whale in the 2003 TJV and completed the race. Since 2004 the trend has been to employ kick up rudders to mitigate against the risk of such damage and all of the fleet’s current leaders operate such systems, though of different concepts/designs. They don’t come without risk however. 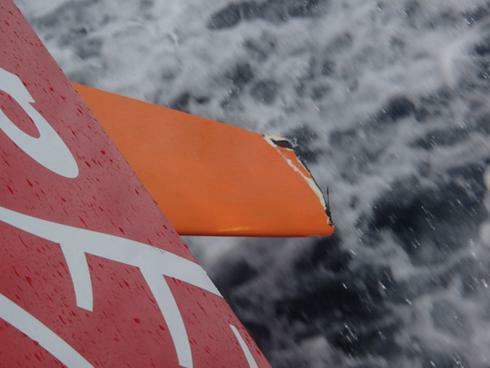 Kick up rudder systems have been blamed for a number of well reported incidents including one high profile dismasting in a Trans-Atlantic Race and the retirement of Virbac and Estrella Damm in the last Vendee Globe and Barcelona Races, respectively. OCD as a matter of course, since Kingfisher have offered clients the options of cassette, kick up or standard spade rudders having undertaken CFD and tank test evaluations to also quantify the potential performance gains of the former. 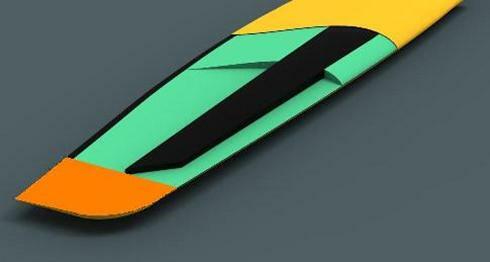 Since Kingfisher all our teams have opted to carry a standard space rudder with sacrificial tip which was developed from our early multihull designs. For Vendee rudders we change the foam core forward of the carbon stock to 200kg foam, run a 6mm titanium rod up the front under a reinforced nose closing laminate to protect the leading edge against rope, net and impact damage. ‘Bubi’ has almost certainly lost just under 300mm of rudder tip which equates to 8% of total rudder area. Providing it’s a clean break (it looks like one and in three days of full on sailing he reported no vibration which is a positive indicator), because the tip is literally added in addition to a completed rudder, there should be no exposed foam and so little chance of further damage by water pressure. The remaining area is equivalent to the same area as our original rudders on our first five Open 60s and so apart from a very slight increase in drag we wouldn’t anticipate any noticeable drop off in performance. In case of deterioration down the line, Bubi is carrying a spare rudder and has practiced the replacement procedure. “Today has been quite a busy night with intense squalls moving at the same speed as I was and staying around forever. I have been beating upwind for nearly six hours which was why my tracking was showing a northerly heading during the night and the wind didn’t shift until a few hours ago. I now have the wind I need (a southerly wind shifting west) as I get closer to the gate. It is also sunny, 12 degrees, and the panels are charging. Today I have seen 26 amps of charge through the solar panels – and remember they are 50 volts!! So that would be 104 amps at 12 volts and this is already a good alternator in a diesel motor. I also have to say that the batteries are really well-charged, and if they were a little more run down I would probably get another 2 or 3 more amps. Find OCD's Acciona 100% Eco-Powered picture library here.